I wasn't planning another blog on football quite so soon, but a couple of thoughts came into my head, and I couldn't resist it. I decided to watch Football Focus on the BBC at lunch time today, because Joey Barton was on the panel, and Paul Scholes was being interviewed. I'm always interested in trying to find out about the person behind the public persona, as people are often different, depending on the scenario. Joey Barton has often been portrayed as a bit of a thug on and off the pitch, and the examples of his violence do nothing to dispel that image. On TV today he came over as being fairly quiet, hesitant in giving strong views (though that may have been due to inexperience in front of the camera), but thoughtful. Paul Scholes has rarely given interviews throughout his professional career, preferring to be more in the background. On the pitch, he was often in trouble due to his tackling ability, or lack of it, and was a tenacious performer, nothing like his shy image. Both players have been described as playing with passion (something I always find a bit strange, as if it's a rarity in sportsmen), and sometimes that gets you into trouble. Wayne Rooney was also briefly discussed on the programme due to his sending off in last nights game in Montenegro. People were agreed that it was 'silly' and 'unfortunate', but if you take that side of his game away from him, he wouldn't be the same person. What utter rot. Martin Keown noted that there had been a great improvement in Wayne Rooney during the last year for club and country. "He'd learnt to control his aggression". These pundits drive me mad. Wayne Rooney is no doubt a good player, and everything has been going very well for him; Manchester United have generally swept everything before them, and Rooney was playing well. My problem with him is that when things are not going well for him or the team, he gets frustrated, and this supposed passion is nothing less than petulance. For me, that is not a sign of a great player. Passion, skill and control go together to make a great player, and for me there is arguably no greater example than the Welshman, John Charles. His great career was with Leeds United, and then in 1957 he moved to Juventus in Italy, where during five years he won the championship 3 times, and the Italian Cup twice. 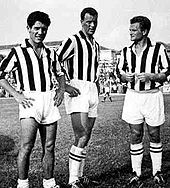 In 155 matches for them he scored 93 goals; he was never cautioned or sent off in his professional career, and at Juventus he was called "The Gentle Giant". Italians held him in such high regard that thirty years after he last played in Italy, they voted him the best foreign player ever to play in their league. He was very versatile, scoring 42 goals in a season for Leeds United, while appearing at centre half for Wales. People can only remember him losing his cool once, and that was when playing a match for Wales. His Brother Mel Charles also played for Wales, and an opponent committed a particularly vicious foul against Mel, which John was incensed by. He ran the length of the pitch towards that player, and was only stopped by team mates from committing who knows what - he was a big man. Brotherly protection was the cause of his anger, but one incident, when he didn't actually end up doing anything, does not mar his perfect example of the fact that you can be successful, with passion, skill and control. A lesson that so many of today's sportsmen could do well to learn. Here's a musical break in the proceedings. A tribute song to John Charles. I hope you like it. Another thought that has been exercising me today is the old argument of technology in football matches. I don't know how long this has been going on, but I guess it's been with us since at least the Geoff Hurst goal in the 1966 World Cup. The arguments, for and against still rage on. Give me a pound for every time I've heard, "We don't want to slow the game down", or "We don't want to lose the human element", and I'll never blog again, as I'll be living on some tropical island. Not losing the human element means that referees will make mistakes (not managers or players of course), and we have to live with that. But players, pundits and supporters don't believe that, given the level of criticism every week. But what really gets me going is that technology would slow the game down. No! Players rolling about in feigned agony, getting the physios on the pitch, only to be minutes later running around like a gazelle; that slows the game down. Arguing with the referee about a foul or a penalty decision; that slows the game down. The elaborate, excessive goal celebrations (even when tapped in from six inches); that slows the game down. The European Referees Association are against technology, and want to see the introduction of two extra linesmen behind the goal extended across the board. When questioned about the mistakes that have been made where this has been trialed, they said that any mistakes were not due to the extra linesmen, but were down to the referee ignoring their opinion. So where's the improvement then? FIFA may well trial technology to determine whether a goal was scored or not. The English FA may well do the same, but not before 2013/14. What are people afraid of? The only thing that people should be concerned about is that the majority of key decisions are the right ones. I can see that goal line technology will come in to the football league in the next few years. But I'd like to go further. To me, there are three key decisions that can dramatically affect a game. Sending off decisions; penalty decisions and goal decisions. Last weekend, Jack Rodwell of Everton was sent off for a foul. From the TV pictures it clearly wasn't a sending-off offence, and the subsequent reversal of that decision backs that up, but it was too late for Everton, and arguably it cost them the game. In a crowded penalty area, was that a trip? Was it is push? Should it be a penalty? Matches have been won and lost on such decisions. We know that television these days has the capacity for instant replays, and a video referee, as in Rugby, can make the majority of decisions in a few seconds. Inspite of what people think, there are relatively few sendings-off, and few penalties per match, given the amount of matches that are played. I'd like to see the referee having to consult the video referee before he proposes to send someone off, or to give a penalty. This would not slow the game down dramatically, but it would give more opportunity for the right decision to be made. Was it a goal or not? Technology can answer this question very easily. There are different technologies available at the moment that could make the answer "fool-proof". Without going into the technicalities, it would be possible to install a system that sends a signal to the referees watch within 0.5 seconds to signal if it was a goal. I've heard some critics of technology say that this would create a two-tier system within football. Come on, don't tell me that there's any one out there who still believes that football is equal. Tell that to Plymouth Argyle as they languish in 92nd place in the football pyramid. Others talk about the cost of introducing it right across football. Again, come on. Many things have been trialed over the years before they were rolled out across the board. This can be trialed in the Premier League, not the Blue Square Bet, for 2 or 3 years. And the cost argument is a pure red-herring. The company behind the Hawk-Eye system have said that they would install the technology for free in every Premier League ground in return for the right to sell sponsorship around the system. Another company, Cairos will bear the cost of installation, and only charge a percentage of what the four referees are paid for every match already. The cost is not an issue. All of this is a bit controversial for the 'purest' I know, but I think it's worth a try. 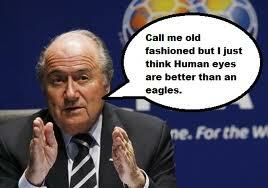 If not, then stop your moaning, get off the referees back, and accept that he's only human.